I will add to the Car issue complaint and that's the view how the hell are you supposed to see where your going when the camera is on the floor behind the vehicle ? even moving to the side you cant see ahead because your on the floor can we go back to a camera view from about 1 metre above the back quarter of the vehicle go up hill and down hill and along the flat? and finally why do most of the vehicles roll over on their side when you corner ? Started on the last and final weapon that's currently SUPER UNOPTIMIZED in the game so 100000% needs an update / fix. This time we went for an entire new model and retexture. Will continue on this tomorrow w/ animations & rigging. Please continue to post your feedback about weapons! We will be expanding our focus to strictly community feedback since most of the issues have been fixed with existing weapons. Stay tuned for more information! As a suggestion, I think a nice addition to the game would be a Khopesh. It could have a dmg rating equal to or a little above a Katana. For those that are wondering just what a Khopesh is, it's an ancient curved blade Egyptian sickle-sword that evolved from Battle Axes. Sorry for the cross-post. I forgot about this thread. Hahah sounds cool ! Thanks for the suggestion! 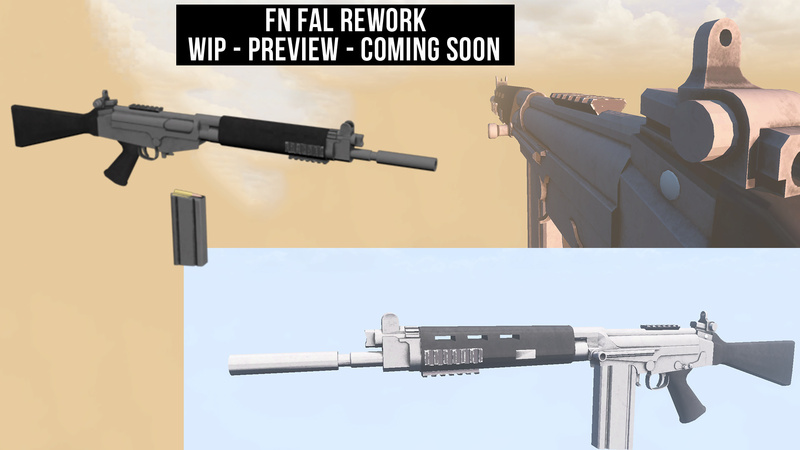 If you want to make the FAL, SCAR H and VSS Compact competitive, you definetly should higher the decay on them (150-200m). and for new guns i would suggest a Vector SMG, an ACR, an IMI Galil and either a MSG 90 or a PSG1. Thanks for the feedback! I will note your suggestions down for review in the near future. Oh baby Gonna look cool! wonder what the PKM (200) box will look like http://prntscr.com/k5oh51 . I think VSS compact is already strong enough. It is around a 3 tap in the head and your dead with med. Only reason people don't abuse this enough is because people don't collect enough of this gun or just don't want to use i they rather use a sniper cause who isn't rich with snipers in this game? snipers are easy to get in open world. should implement vss compacts or FN Scar H in Survival instead without the buffs.